This family has given us major tourism goals by traveling the northern areas together on a single motorcycle. They call themselves the ‘The ‘Road Leopards’. However, what makes the Road Leopards so different from the usual tourists is that they decided to have this journey on a motor bike. Irfan along with his wife and two children travelled the northern areas with him on a motorbike. 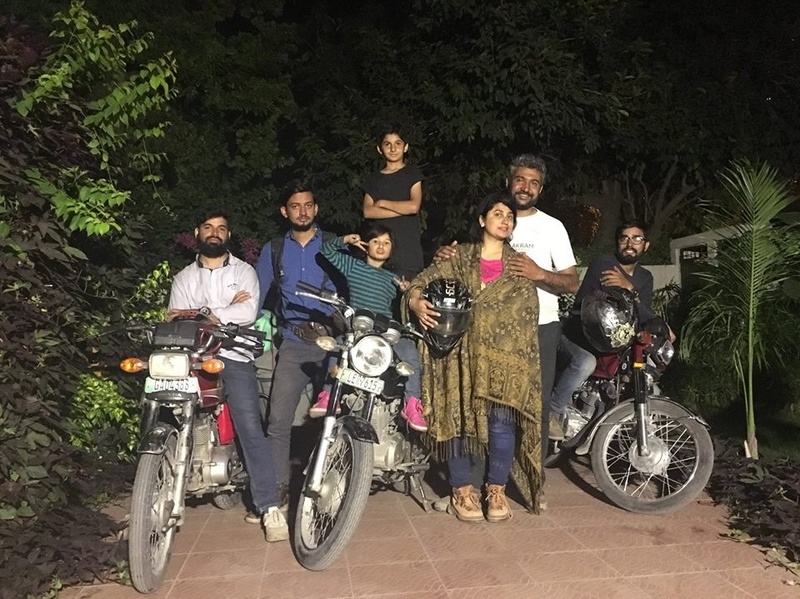 This is a very brave decision for a husband and a father because travelling northern areas on a motorcycle isn’t an easy job and with four people on one motorbike makes it more difficult. The Road Leopards recently completed their second journey visiting places like Deosai plains and national park, Ali Malik Top, Naran Khagan Valley and other parts of the northern areas of Pakistan. The couple believes in living their life to the fullest and despite all the problems they faced on this trip, they seemed to have loved the experience to bits. They started their journey on September 22nd and ended it on 2nd October and we hope to see more families having fun as summer is just about to end. But make sure you stay safe and don’t do anything which might risk your life. Stay in touch with the Road Leopards on their Facebook page! This is how professional photographers take pictures. using the most useful feature of cameras named timer :-) Maybe you never heard of it. or maybe using drone camera? Read the above comments then you ll know that this ‘professional’ photographer wasn’t alone. Wheres the point of all this so called journey by ‘yourself’ when you are bringing in a team with you? and what is last of all? seems pictures exaggerated, means no one move with open hairs on bike like this woman and the children. i think they guy took other family on a car while he was on the bike and some other people are taking their pictures. because bike par bunda boooth bun jata hai woh bhi nothern areas mein ja kar. 4 members on one bike. Great example. There goes the safety out of the window. No knee caps(guards), no helmets. We may belong to third world, but we should be responsible for our lives. Good to see them happy. But fun we will have till we die because we are PAKISTANIS. SALUTE TO THE ARMY. No reply to my comment. Do you hate Pakistan army? They have Team With Them while they were travelling, And his son was sitting on team member bike all the time, also team member was making pictures and drone footage, This article came on express, Parhlo and one other site forget the name. I want a wife like that who will accompany me in my life adventures. I think I have to dump my current fiance as she is more interested in buying clothes from Khaadi and in fake fashion than anything of productive nature..:(. how about not getting married? You can then have an adventure every other day. And what do you know about relationships, Sheldon?